These security cameras feature Swann's True Detect PIR Thermal-Sensing technology to reliably detect heat-generating moving objects, such as people, large pets & cars. With more accurate motion detection you have more reliable notifications & recording, eliminating false triggers such as falling leaves, bugs, rain & more, saving you hard drive space & playback time. This 5MP Super HD security camera is the perfect addition to your Swann DVR-4980 Series when you need extra cameras to cover blind spots. The sturdy aluminum construction is built tough for the outdoors or indoors with IP66 weatherproof rating and with its powerful infrared night vision, see in the dark up to 100ft (30m). The camera comes with a roll of 60ft (18m) BNC cable for connecting the camera to the DVR. The Ideal Security SK602 series wireless alert uses a motion sensor to detect motion and sends a wireless signal to the linked receiver. Once a signal is received by the receiver, the unit will chime, alarm (100dB) or just flash lights. Monitor driveways, gates, sheds, walkways, and swimming pools. Monitor front or back doors at small businesses, or supervise children to keep them safe. The motion sensor works in both light and darkness, but it is not pet immune.To scare off intruders, choose the high-decibel alarm. In situations where movement must be restricted, this alarm set can provide a gentle chime indication to warn others. Use the lights-only mode to silently keep an eye on movement in areas of your home, shop, or place of work.The range from the sensor to the receiver is up to 120 meters (390 feet). The sensors viewing angle covers an arc of 45 degrees and detects motion at a distance of 5-8 meters (16-26 feet). Protect your 1-2 bedroom home or small retail location with an HD surveillance camera system from Q-See, including a 8-channel HD DVR, 8 1080p cameras, and a pre-installed 1TB Purple Surveillance Storage drive from Western Digital. View cameras and recordings anytime right from your smartphone, tablet, or computer with Q-Sees remote connection feature and always know your property is safe. These HD cameras are weather-resistant and perfect for indoor or outdoor use, and the metal housing and mount design protect against tampering and vandalism. Built-in LEDs allow you to see up to 100 feet in complete darkness, delivering protection and peace of mindday or night. 5MP Outdoor True Detect Thermal-Sensing Bullet Security Camera - White These security cameras feature Swann's True Detect PIR Thermal-Sensing technology to reliably detect heat-generating moving objects, such as people, large pets & cars. With more accurate motion detection you have more reliable notifications & recording, eliminating false triggers such as falling leaves, bugs, rain & more, saving you hard drive space & playback time. This 5MP Super HD security camera is the perfect addition to your Swann DVR-4980 Series when you need extra cameras to cover blind spots. The sturdy aluminum construction is built tough for the outdoors or indoors with IP66 weatherproof rating and with its powerful infrared night vision, see in the dark up to 100ft (30m). The camera comes with a roll of 60ft (18m) BNC cable for connecting the camera to the DVR. 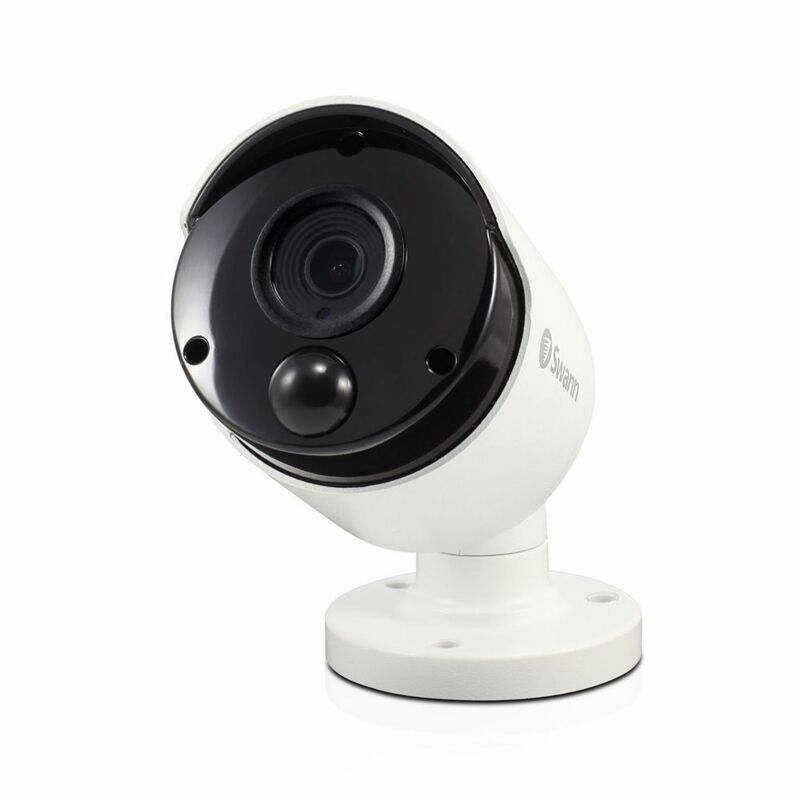 5MP Outdoor True Detect Thermal-Sensing Bullet Security Camera - White is rated 5.0 out of 5 by 3. Rated 5 out of 5 by Jon L. from System for Church Found system easy to install and activate. Picture quality is terrific. Easy to setup and manage. Most satisfying package. Need a complete system for this to work?